KITH once again teams up with adidas Football on a multi-dimensional offering that places emphasis on KITH’s own football clubs: the Cobras, Flamingos and Rays. Marking their third and final collaborative effort, the collection named “Chapter 3: Golden Goal” sees three new takes on the aforementioned club’s kits. In the short teaser posted above, all three clubs are preparing to face each other on the pitch in what seems like a rule-breaking, impossible match up. Hits of America’s signature colorway of red, white and blue can be found on the Flamingos’ mostly white kit, while the Cobras take on a dark navy hue. Finally golden adidas and KITH insignias finish off the overall look of each team’s kit. Stay tuned for more details and the launch date of the KITH x adidas Football “Chapter 3: Golden Goal” capsule which will include tops, shorts, jackets, socks and footwear. In the meantime, take a look at our recent feature: “10 Football Kits That Will Take You From the Streets to the Pitch Part 2.”. KITH and Adidas Soccer have announced that the third installment of their partnership, “Chapter 3: Golden Goal,” will be available at KITH retailers and KITH.com on Friday, June 29. Their third and final collection showcases Kith’s three soccer clubs – the Cobras, Flamingos, and Rays. Among the jerseys included in Chapter 3 are several patriotic, red, white and blue colorways, as well as camo-printed Rays design and a sleek, metallic gold rendition. 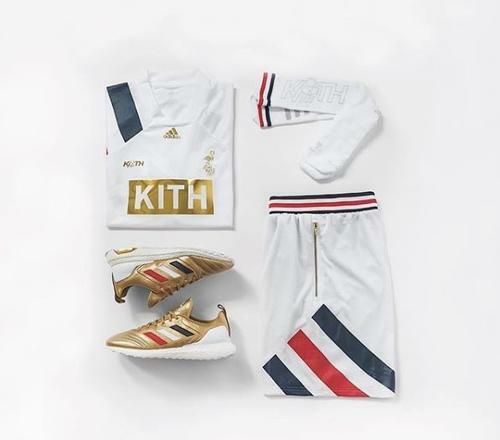 In addition to the jerseys, KITH x Adidas Soccer’s upcoming collection features shorts, jackets, socks, scarf and footwear, most notably the Adidas Copa Mundial 17 Ultraboost in metallic gold. Check out some of the apparel, as well as the teaser video, in the IG posts embedded below. KITH’s forthcoming adidas Soccer collaboration doesn’t make its final stop in New York. Providing a contrast to the recently revealed Cobras collaboration, KITH’s second home of Miami will also host a special capsule collection. Its team will don a soft color palette which mixes pink, grey, slate and navy along its selection of pieces. Dubbed the KITH Flamingos, the team’s pieces consist of full kits for on- and off-pitch settings in addition to warm-ups, compressions pieces, socks and goalie jerseys. You’ll also find a velour suit, tracksuit and tees to round out its apparel choices. Footwear closes out the collaborative range with a trio of silhouettes in the ACE 17+ Cleat, ACE 16+ UltraBOOST and ACE 17 TR1. Each dons a mix of the aforementioned color blocking such as KITH’s signature toe coloring, primary pink upper and all white, respectively. The KITH Flamingos x adidas Soccer capsule will launch at all KITH flagship locations and kith.com on June 2.